Prashant Kamat, the Rev. John A. Zahm, C.S.C. Professor of Science has earned a Hersch-index (h-index) over 100, an achievement attained only by the best and most accomplished scientists. The h-index is a measurement of productivity and impact of a scientist’s published work. Kamat is one of the most prolific and highly cited researchers in physical chemistry worldwide with over 400 peer-reviewed publications. He has edited three books, and is a contributor to 14 books and monographs. His work has been cited more than 33,000 times. Kamat earned his masters and doctoral degrees from Bombay University in India in 1974 and 1979 respectively. After completing postdoctoral research at Boston University and the University of Texas, he joined the Notre Dame faculty in 1983. The overall goal of Kamat’s research is to build bridges between physical chemistry and material science to improve energy conversion efficiencies. His research falls under the areas of nanotechnology and material chemistry, solar energy conversion, chemical processes in heterogeneous media and solar fuels. 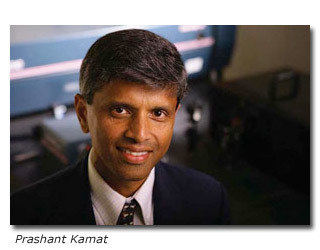 Kamat is a highly visible scientist through his contributions as the deputy editor for the Journal of Physical Chemistry Letters. He is also a Fellow of the Electrochemical Society, American Chemical Society, and the American Association for the Advancement of Science. He has earned several prestigious awards including the Irving Langmuir Award in Chemical Physics from the American Chemical Society and the Chemical Research Society of India Medal. Originally published by Stephanie Healey at science.nd.edu on January 24, 2014.